There are some artist who seem to be unable to process their art through a filter or postulate behind a facade. Instead of ink they choose to write with blood and tears. Not because they are trying to be novel or cool but because they don't know any other way to do it. 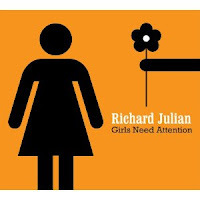 Richard Julian has always been fearlessly confessional and frank, but on his newest album he seems to have hit a deeper vein to draw from. Girls Need Attention seems to either be birthed from, or attempting to document, a break up. There is rawness, sadness, and even resignation beautifully dripping through all of the tracks. You might actually even start to feel a little down if it weren't for his coy delivery and his bouncy guitar playing. The players behind him, including producer Lee Alexander and Wilco's Nels Cline, cleverly surround the melancholy lyrics with bright and spacious arrangements. After listening through the album, "Sweet Little Sway" was the first track I went back to. The song has a great rhythm and vibe to it, even though the lyrics describe a relationship that seems to only have a chance when it's away from the day to day. The simple tongue in cheek lyric "We ain't been getting along the way lovers do in a song" is great example of Richard's sense of humor and irony. "Girls Need Attention" is a whimsical reminder that...well, girls need attention. You could maybe read into it that he is speaking on the other side of a learning experience and not necessarily just offering some sage advice. Either way, it's true and once again he allows the upbeat music to buoy the weightiness of the lyrics. Some other great stand out tracks on the album are the bluesy "Words" and the Randy Newman cover "Wedding In Cherokee County." Although he never really lands on the touchy-feely side of love, Richard's song are amazingly romantic due to their honesty and authenticity. He doesn't shy away from the directness of what he is trying to convey and that in itself is something that all relationships could benefit from. His albums have always proven to be really cool date night backdrop music and Girls Need Attention is no exception. Just make sure to pick the right lyrical moment when going in for the kiss or you could find yourself locking lips to a line like "The world we made can't be reconciled with the one we've come to know." Not exactly a hallmark card, but still a heartbreakingly beautiful line from a heartbreakingly beautiful album.